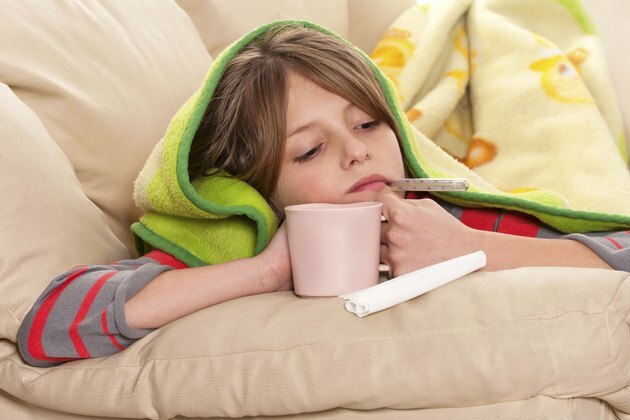 Should You Cover Up a Child With a Fever? Knowing how to manage a child’s fever properly at home can prevent you from having to make unnecessary visits to your pediatrician and the emergency room. Home fever-management strategies, such as covering a fevered child with a sheet or blanket, play a key role in helping regulate body temperature, provided you don’t overdo it. A fever is typically an attempt by your child’s body to control and fight an infection or disease. Fevers occur when the immune system releases chemical substances that trigger the hypothalamus to boost the body’s core temperature. Generally, your child has a fever if her rectal temperature meets or exceeds 100.4 F, her oral temperature meets or exceeds 99.5 F or her underarm temperature meets or exceeds 99 F, according to the MedlinePlus online medical encyclopedia. The key to providing proper care for a fever-ridden child lies in making him comfortable and ensuring that the temperature doesn’t get out of control. Encourage him to lie down on a couch or bed and cover him with a medium or lightweight blanket or sheet. Beneath the blanket or sheet, clothe the child in a single layer of lightweight clothing, such as pajamas. As a rule, avoid using a heavy blanket or several blankets at the same time, since doing so may lead to overheating and an increase in discomfort. One of the body’s methods of increasing temperature is to constrict the blood vessels and cause shivering. Even though you know from taking your child’s temperature that she has a fever, you might observe this shivering and other signs of being cold and want to bundle her up in several layers of blankets so she’ll be comfortable. Avoid this temptation, cautions Dr. Donald Vickery, former clinical professor in family medicine at the University of Colorado Health Sciences Center and co-author of “Take Care of Yourself.” Your child already has an elevated temperature and bundling her up will only serve to raise the temperature higher, possibly causing it to reach dangerous levels. When used in combination with proper covering techniques, liquids play an essential role in keeping fevered children from becoming excessively uncomfortable. Encourage regular drinking to prevent dehydration and consider giving your child a lukewarm bath to help bring the body temperature down. If your child doesn’t want to get in the bathtub, you can also press a damp washcloth against the hot skin on his face, chest, back and legs. Follow up on the skin-cooling procedure by covering with a lightweight sheet or blanket to prevent possible chills. Should You Use Ice Packs on an Infants with High Fevers?